Honore´ here. Are you ready for our long hot summer? Based on last week's record highs and the forecast for the next few days, seems like Mother Nature has plans to provide us with all sorts of reasons to stay in the house and make art! My summer indoor adventures include stitching - knitting and quilting - and lots more art journaling, especially playing around with using a variety of media on my journal pages. I plan to venture out mainly for two things: food and classes at The Queen's Ink! 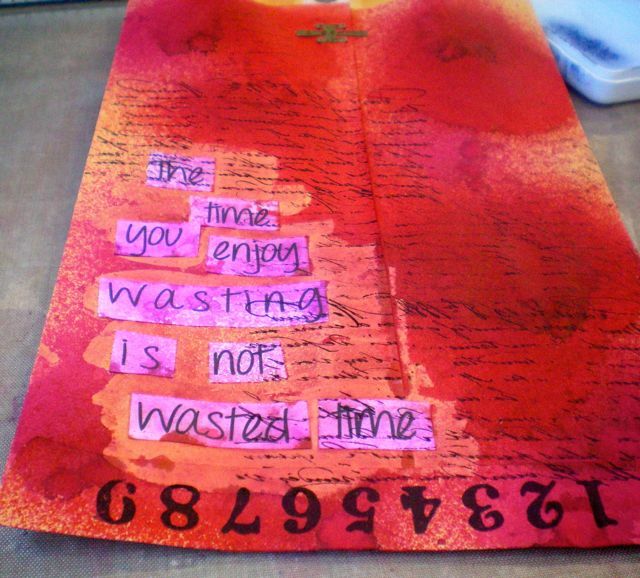 This month, I am joining both the Suze Perrot Jumpstart Your SMASH Journal class and Karen Bearse's third Art Journal Series class. 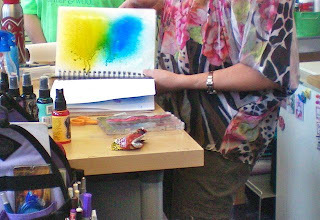 I was lucky enough to get to Karen's second class and thoroughly enjoyed it...we made pages primarily using Dyan Reavely's Dylusions ink sprays, made by Ranger and carried, of course, by The Queen's Ink (and a new shipment just arrived about 10 days ago). This was an enjoyable class; I especially liked how Karen had created project boxes for each of the four pages we made. Each project box contained the supplies and materials we needed to make the page. And the boxes were rotated among us, according to which page each table was making. Very efficient way to spread resources and it also allowed Karen to spend more quality time with us, say to give a demo on a specific technique. July's class promises to be most exciting: we're going to play with Pan Pastels - another recent acquisition by The Queen's Ink. You can watch this brief YouTube video for a quick overview of the product and how it'll work on your art journal pages. If you haven't been to the shop recently, do drop in (maybe on your way out to get food?) - there's a brand new Pan Pastel display, plus the many different applicators and sponges that are recommended. 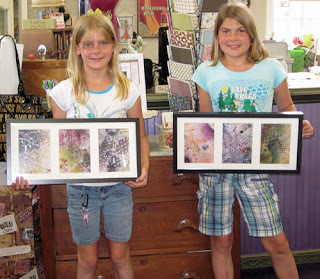 Patti and Lolly just took Donna Downey's Pan Pastel workshop, both loved it, and are happy that Donna is planning a visit to the shoppe late in the year. Stay cool and I hope to see you in one or both of these classes. PS. Did you know you can check out new product arrivals at The Queen's Ink here? One of our "Royal Loyal" customers (known to family as "Aunt Dorothy", recently attended workshops with Fred B. Mullett a.k.a. Fish Boy, and learned his elegant mess techniques and secrets. Her nieces Ashley (age 11) and Rachel (age 10) were Dorothy's students in a recent summer play day in Dorothy's studio. Look at the results... WOW! Very impressive, and they're both going to be ready for that inevitable "What I Did on My Summer Vacation" essay when school resumes. We just hope their teachers are into the visual artistry! We certainly are! 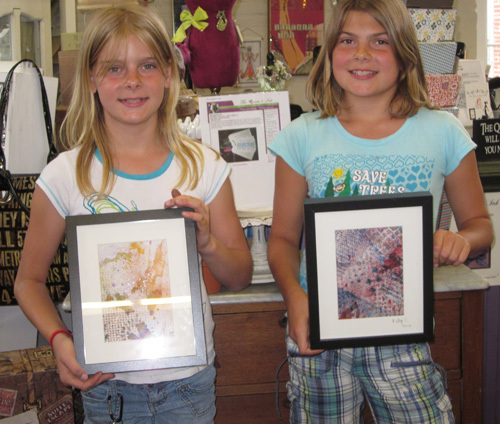 Show us what you're doing with your young artists and we'll publish their work here. We're always interested in seeing what our future artists are creating.